Known originally as Ballard Bitter, then Redhook IPA, and now Long Hammer IPA, Redhook's year-round India Pale Ale has gone through it's share of re-branding since it's original brewing back in the dark days of 1984. The current name is meant to pay homage to those from the past that used long hammers to construct "everything great that was ever built—transcontinental train tracks, impossible pipelines, soaring skyscrapers." That's all well and good, but what's inside the bottle? It's pitched as a standard Pacific-NW American IPA with the usual ingredients. During the boil Long Hammer is hopped with Alchemy, Cascade, and Willamette varieties, then after the boil it's dry-hopped with more Cascades. The backbone is built from Pale, Caramel, and Munich malts. President Dave Mickelson says the resulting brew is the IPA that "consumers will reach for again and again, drawn to its distinctive hoppy aroma and bold drinkability." Yawn. Sounds like Anheuser-Busch might just be helping with more than just distribution! All jabs aside, let's see how this over quarter-century old brew fares. 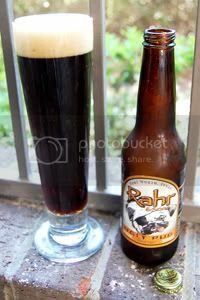 Appearance: Slightly hazy golden-amber body. Two fingers of bubbly, off-white head that quickly fade into a ring around the glass. Below-average lacing. Aroma: It's all just a little thin. Some citrusy hops over caramel malt and lots of booze. This is nothing like what an IPA should smell like, even if you adjust for the general thinness. Taste: Unfortunately, the hops aren't much more potent in the mouth. They're somewhat bitter off the line, but without any of the usual floral or citrusy notes to back them up. It's much the same in the malt department. Thin, grainy pale malt just kind of chugs along in the background like the rest of the beer. Everything but some of the bitterness vanishes almost instantly. The alcohol is still somewhat prominent, but a little more hidden than in the nose. In a bizarre twist, there's a lot of soap flavor here. So much so, that the first glass that I tried I dismissed as some sort of washing-up accident where I forgot to rinse the glass before drying. But, alas, all six bottles were just as soapy. Mouthfeel: Medium-light body with a good bit of frothiness and a carbonation level firmly on the high side. Finish is somewhat dry. Drinkability: It's very bland, and rather soapy. So, while it may go down quickly, what's the point? 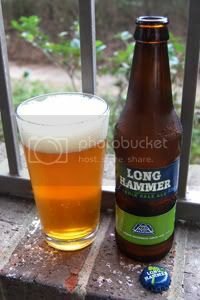 Verdict: Shallow, bland, and watery, Long Hammer disappoints at every turn. This would be weak even for a Pale Ale, let alone a full-blown IPA. Shame on Redhook for misusing the IPA label so badly.